Lt. Gen. H.R. McMaster, President Donald Trump's national security adviser, recently spoke at the naturalization ceremony of an Iraqi family he sponsored. 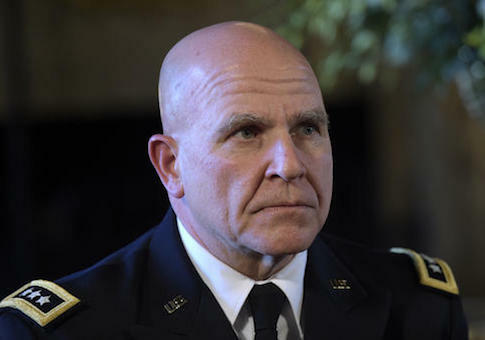 McMaster attended the ceremony in Alexandria, Virginia in early March, CNN reported Tuesday. The family has known McMaster for years, and the general worked with the Iraqi man during the 2005 Battle of Tal Afar in northern Iraq. McMaster commanded the 3rd Armored Cavalry Regiment in 2004 and was ordered to secure Tal Afar. He was lauded for his leadership by many observers, including former President George W. Bush in a 2006 speech, and secured the city from insurgents in what was considered a successful operation. After the battle, McMaster sponsored the Iraqi man's family to come to the United States and become American citizens. The family invited McMaster to the naturalization ceremony, where he also delivered remarks. McMaster has taken over for retired Army General Michael Flynn, who resigned amid controversy of ties with Russian officials. McMaster will remain in the Army as he serves in the White House. Trump ordered on Monday a new travel ban to replace the previous order from January that was overturned by the courts. One of the major differences in the new travel ban is that Iraq is no longer included on the list of countries where travel from is prohibited. Secretary of State Rex Tillerson said that the United States received greater assurances from the Iraqi government that they would provide stricter security screening. This entry was posted in National Security and tagged Army, H.R. McMaster, Iraq, National Security Adviser. Bookmark the permalink.